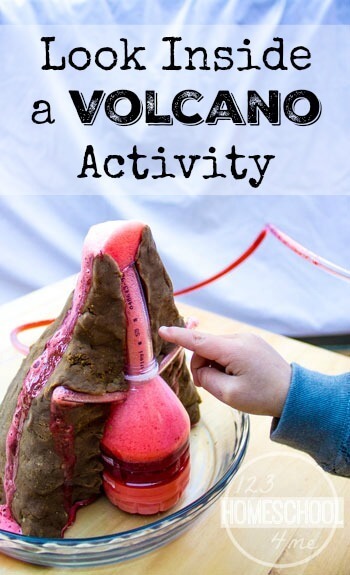 Take building a volcano science experiment to whole new level with this Look Inside a Volcano Project for kids from preschool, kindergarten, 1st grade, 2nd grade, 3rd grade, 4th grade, 5th grade, and 6th grade students. 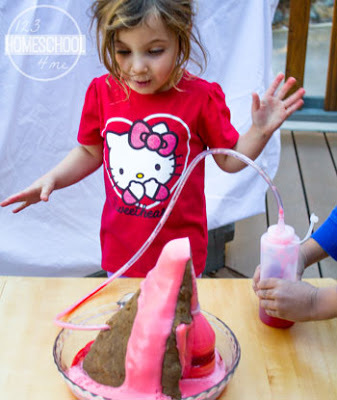 A homemade volcano is pretty much the epitome of a fun, appealing science experiments for kids. 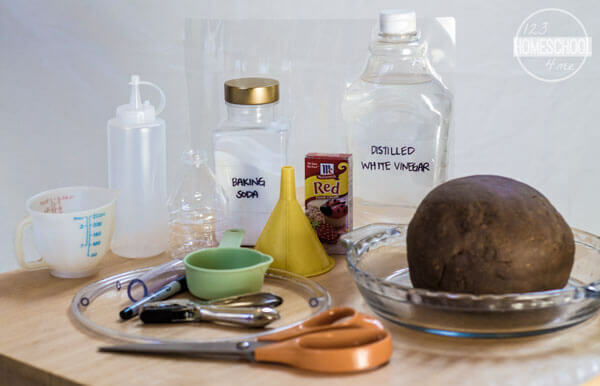 Let’s be honest – all you really need to do this activity is an empty water bottle, some baking soda, vinegar, and maybe a little food coloring and your child is pretty much guaranteed to have a good time. If you want to make it a little more realistic, bury your water bottle in some sand or dirt and watch your very own volcanic eruption. My kids and I have made some version of a homemade volcano probably a dozen times. However, this time I wanted to make the experience a little more educational by allowing the kids to actually Look Inside a Volcano. 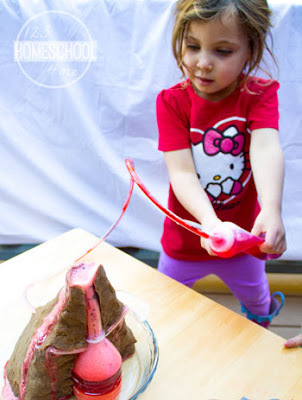 The one concept I always try to get through to even my youngest preschooler is that in reality, the red stuff that comes out of a volcano is melted rock. After the melted rock comes out of the volcano, we call it lava, but when it’s INSIDE the volcano, we call it magma. (My 3 year old is very proud of her ability to remember these words.) However, since we’re learning terminology anyway, I thought it would be fun to challenge my 6 year old with some more words that relate to volcanoes. Instead of just using an empty bottle or covering the bottle completely, this time I decided to try covering the water bottle half way leaving a cross sectional view. 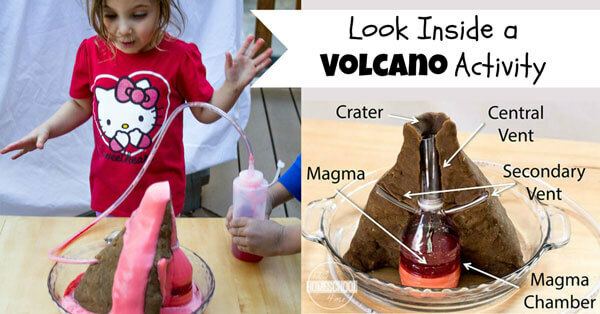 This allows the child to effectively see inside the volcano. To make it more realistic and add more terms, we used clear tubing for the volcano’s vents. Many volcanoes have a primary central vent as well as a number of smaller secondary vents. These vents form when the pressure inside the magma chamber builds up, pushing the magma to the surface. When the magma finally breaks free in an eruption of lava and rocks, a crater is likely to form where the vent meets the surface. I also thought it would be fun if we were able to erupt our volcano from a distance. We used a separate tube and an inexpensive ketchup dispenser to load the vinegar into our volcano and start the chemical reaction to simulate our lava flow. 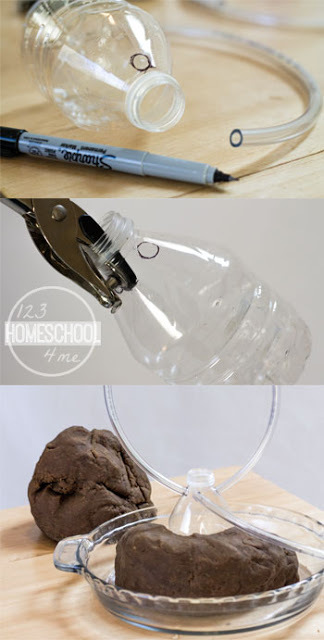 The first step is to insert the smaller tubes into your water bottle. 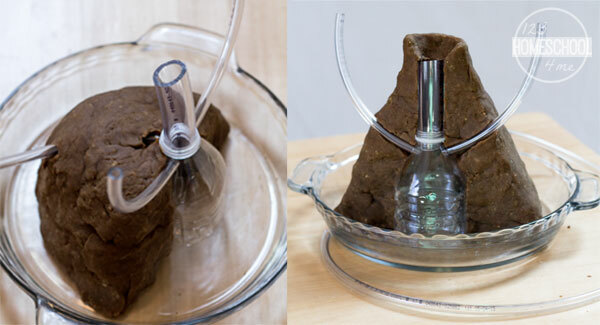 You want to end up with two 6″ tubes directly across from each other on the left and right of the bottle (the secondary vents) and one long 3 foot tube between them at the back (play dough side) of the bottle (the tube for inserting vinegar). To insert these tubes, first trace around the tube at these 3 locations near the opening of the water bottle. Then use the single hole punch to cut out the interior of your drawn circles. You may need to punch 3 or 4 times for each hole. Then insert the tubes as shown. 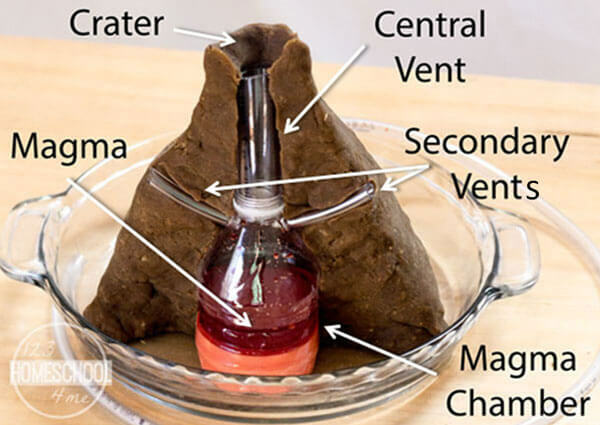 Next, cover half of the magma chamber (water bottle), secondary vents, and vinegar tube with brown play dough. Next use your marker to mark the edges of your crater on a thin piece of clear plastic. Use your lines as a guide to cut out a small piece of plastic which will contain the escaping lava and force it to go down the volcano side and not the cutaway side of your model. Attach the plastic to the volcano using play dough as shown. As mentioned earlier, at this point I filled my water bottle with the baking soda solution, but I had to remove my clear plastic shield and add it back at the end. It would have been easier to fill my bottle in Step 2 before even adding the large tubing for the central vent. Using the funnel, I added 1/4 cup of water with 20 drops of red food coloring. To that, I added about 1/2 cup of baking soda to the water bottle. The baking soda quickly settled to the bottom of the bottle. You could likely try using less water and a chopstick to stir up the mixture in order to make it look like more uniform “magma,” but I just left it as is. 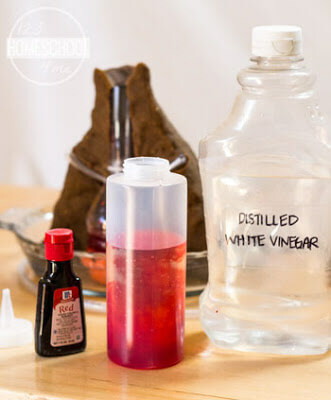 To make the vinegar solution, simply fill your ketchup bottle most of the way with vinegar and add some red food coloring. You could also add a little dish soap to make the lava more foamy. I used about 20 drops of food coloring and a tablespoon of dish soap. Now you are ready to start your volcanic eruption! Our “lava” was fully contained, but unless you’re braver than me, I might recommend taking your volcano outside. To start the lava flow, simply insert your ketchup bottle tip into the long tube and squeeze the vinegar into volcano. Can I use this as a steam fair project? My 5 year old wanted to do something like this.